Wedding stationery is playing a very big role in the decor of lots of modern weddings, but whilst looking incredibly stunning, it also plays a necessary role in keeping your entire day running smoothly. Apart from the obvious function of inviting all of your guests and making sure that everybody has responded in good time, your stationery will also help guide your guests through the day without a hitch. Order of Service are the perfect way to help everybody keep up with the ceremony itself, this can be especially handy if your service requires guests to take part. Order of the day will help guest to navigate when and where to be for specific 'not to miss' moments such as photos, speeches, cake cutting and the first dance. Table plans, place cards and table numbers will make sure that everybody is seated swiftly and correctly for the wedding breakfast, whilst a menu placed on each table will keep those hungry guests happy! 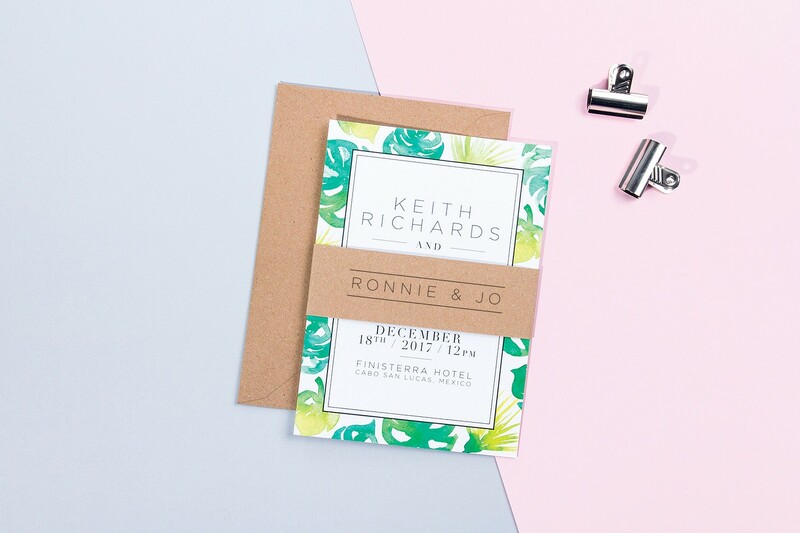 So when should you order and send out your wedding stationery? If you are getting married during the summer or on a bank holiday it is advisable to send a save the date card so that your guests won't miss the big day. These should be sent between 6-12 months before your wedding. If you are having a wedding abroad then you will definitely want to send out save the dates. Depending on the destination of your wedding you may want to give your family and friends a little extra notice to save money and book the time off work etc, and can send them out at the 12-18 month mark. Note from a stationer: Save the dates are perhaps one of the quickest and easiest pieces of stationery to produce so you shouldn’t need to book these too far in advance of your scheduled posting date. That being said, it’s alway best to check dispatch times with each individual stationer as some processes can take longer than others and you may need to book a design slot with your stationer for custom designs especially. It is customary for wedding invitation cards to be sent out approximately 3 months before the day. If you are marrying abroad then you may want to lengthen this timescale to 6 months before your wedding date. You may want to think about including any other relevant information at this time, including RSVP cards, directions, hotel suggestions, menu choices, taxi services or a map. Note from a stationer: Now’s the time to think about what information your guests need from you and what you need to know back from them i.e. who’s attending, menu choices (if relevant), and dietary requirements, all of this should be simply listed on the rsvp supplied. I normally suggest that rsvp dates are set at 8 weeks before the wedding date, at least. There’s still a lot of planning to do once you know which guests will be attending, so it’s really crucial that you give yourselves and your suppliers enough time to get organised - there’s nothing worse than a last minute panic when it’s easily avoided! Once again, always check in with your stationer regarding their own personal lead times, some companies will quote a 2 week dispatch whereas others will need up to 2 months to process your order, especially during peak season. To keep stress levels at a minimum I would suggest ordering stationery for the day itself at least 4-8 weeks before the wedding date. This includes items such as order of service, order of the day, table numbers, menus, place cards and table plans. Note from a stationer: It’s absolutely crucial that you know the lead times of your stationers at this point and adhere to them. Those lead times may look like a long time but there are a lot of things to think about i.e. design & proofing, printing, assembly (if applicable), and postage. Postage is a biggie - occasionally things go wrong in the post which unfortunately is unavoidable - but make sure this doesn’t effect your day by allowing enough time to rectify any unforeseen mishaps! A thank you card is one final reminder of your day and a great way to thank your friends and family for their presence and kind gifts. It is customary that they should be sent no later than 1 month after your wedding date. Remember that you only need one invitation per family or couple and one order of service can be shared between two. I hope that you’ve found this helpful, please don’t hesitate to get in touch with Kim at Pingle Pie if you have any further questions about when to order your wedding stationery. This blog post is written by Pingle Pie, one of our lovely Wedding Planner Ambassadors. Kim and Rob craft and create gorgeous designs in Britain with meticulous attention to detail. You can check out all the work that they do over here.